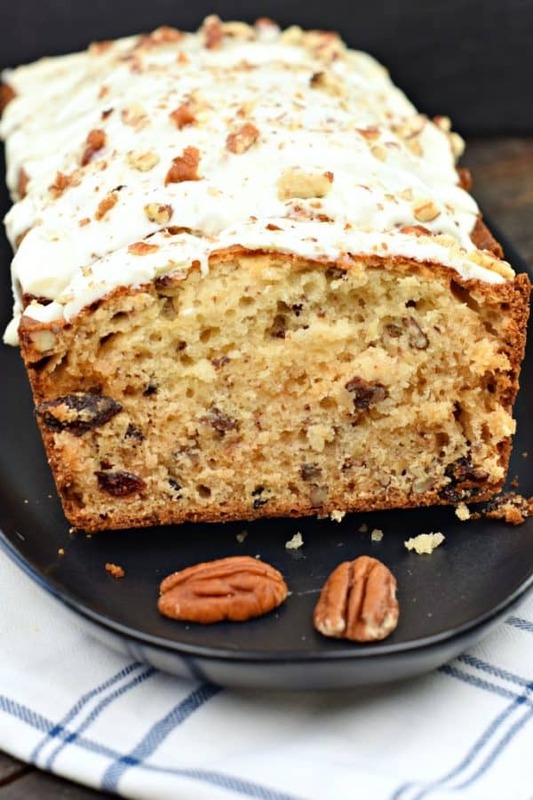 Sweet and salty, this White Chocolate Cranberry Pecan Bread is perfect for breakfast, brunch, or dessert! Great holiday treat, and freezes well too! Thanksgiving is over, which means bring on all the holiday treats. Right? Good thing for you guys, I’ve been baking holiday desserts for about two months now! So get ready to start baking with me! First up? 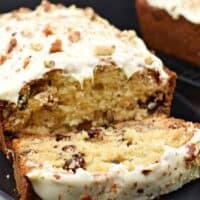 This White Chocolate Cranberry Pecan Bread recipe. I don’t know about you, but I love keeping baked breads in my freezer. They come in handy when unexpected guests drop by, perfect for pulling out of the freezer and defrosting, then serving with some coffee! Speaking of unexpected guests, I got a big surprise this Thanksgiving by my son. We haven’t seen him since May, and weren’t expecting him home until Christmas. However, I was awoken by my husband at 5:30am on Thanksgiving morning with a cup of coffee, and in strolled my boy. My birthday boy. Not only was it Thanksgiving, but it was also his 21st birthday. You guys, surprised doesn’t even cover how I felt seeing him walk into my room!!! And to think my husband has been planning this for over a month, just shocked. So grateful to be married to someone who knew just how much having my kid home on his birthday (and Thanksgiving) would mean to me. It was also the first time our daughter, who left for her freshman year of college, was home. Our family was together. Priceless. 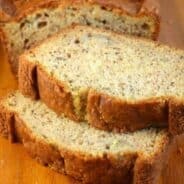 Thankfully, I stock up on baked goods all year long, so if Thanksgiving dinner and dessert wasn’t enough to fill us all up, there were plenty of loaves of baked breads in my freezer! 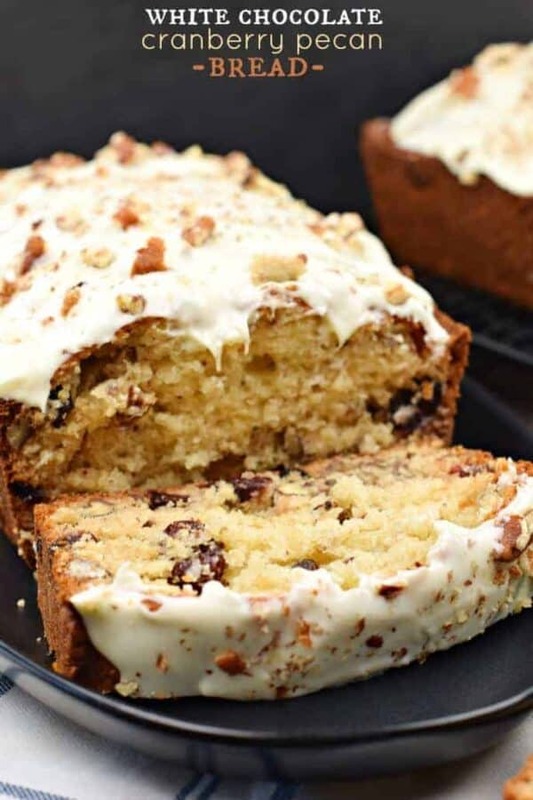 This White Chocolate Cranberry Pecan Bread is the most delicious way to enjoy your holidays with your morning coffee. 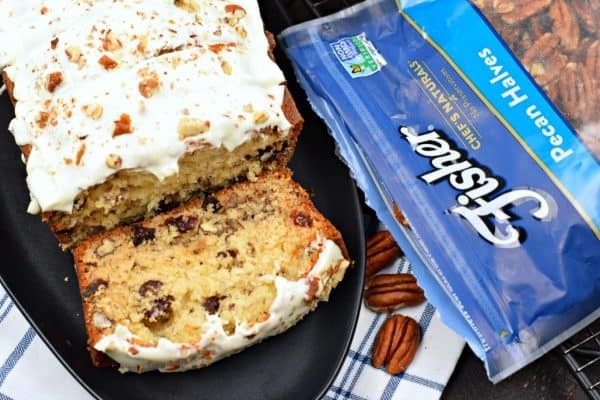 You’ll love the sweet bread with the nutty pecans! And the melted white chocolate on top adds the perfect finishing touch. I’ve been working with Fisher Nuts since 2013, I love their freshness and that they are preservative free. My kids love the stand up bags with the resealable closure for snacking! So convenient and keeps the nuts fresher for longer! 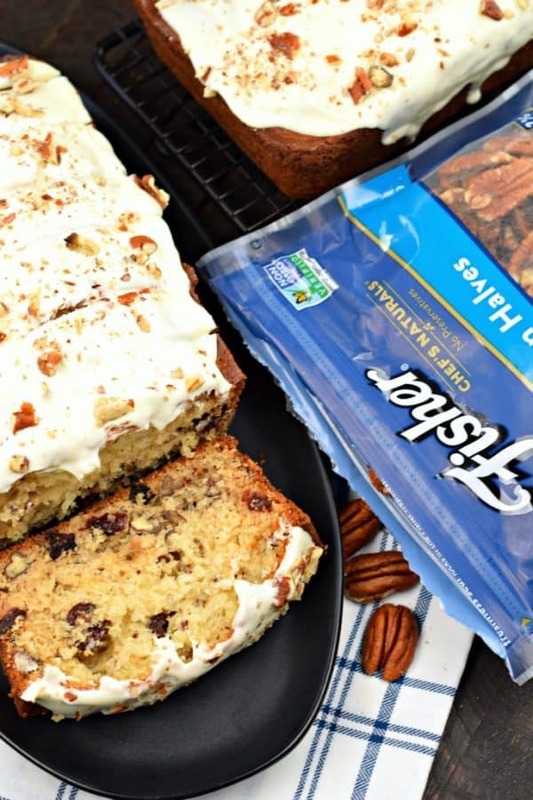 Stock up on a few extra bags this year for your holiday baking! Preheat oven to 350°F. Grease two loaf pans with baking spray, set aside. In a large bowl, beat butter and sugar together. Add eggs, one at a time. Beat in almond and vanilla extracts. Add flour, baking powder, baking soda and salt. Slowly mix in yogurt, by hand, just until blended. Do not overmix. Fold in the cranberries and the pecans. Pour batter into two loaf pans, evenly. Bake loaves for about 60 minutes, until a toothpick comes out clean. Remove and cool on wire rack 10 minutes. Remove from pan and cool completely before adding glaze. For the glaze, melt white chocolate wafers for 1 minutes in the microwave in a clear, glass bowl. Stir until smooth and drizzle over cooled bread. 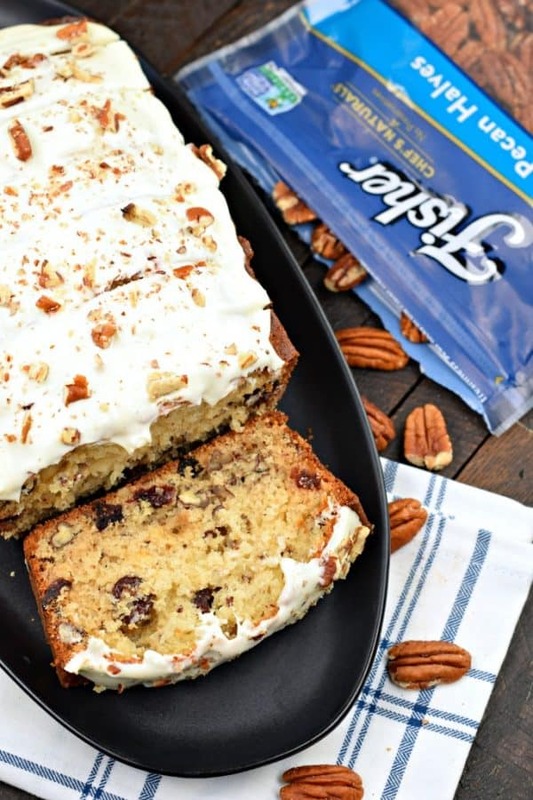 Immediately sprinkle with chopped pecans. To store, wrap loaves of bread in foil, then in a ziploc bag. Store on counter or keep in freezer until ready to use. ENJOY! Turtle Fudge: the perfect treat to add to your holiday gift giving list! Pecan Egg Nog Cookies: these little unassuming bites melt in your mouth and I guarantee people will be asking for the recipe! 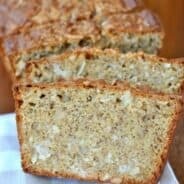 About what size loaf pans did you bake this in?! Thank you! Can you use White Choc Chips in this? Looks yummy will give it a try with dried cherries since I am allergic to cranberries. In fact I would bet any type of dried fruit would make a great variation. Thanks for the recipe looks like a winner. What an absolutely fun surprise to have your son home for Thanksgiving! 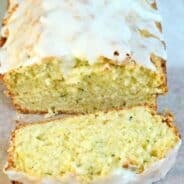 Love this fun sweet bread! I need to stock my freezer with some batches of bread and cookies ASAP!